Don’t let another road trip go by with your smartphone sliding about the car as its GPS app shouts out turn-by-turn directions. Mount it onto your dash! A year ago, I officially broke up with ‘Jane,’ my portable GPS device. On route to the family summer vacation on the North Fork of Long Island, my iPhone’s native Maps app bested Jane. I had mixed feelings, but it was clearly time to move on to newer and better tech, even though my Maps app couldn’t talk to me like Jane. But Google Maps’ voice turn-by-turn navigation iOS app was just around the corner. And so was Apple’s, even though ‘Mappelgate’ gave Google Maps the edge. I’ve spent time with both on the road over the past year, and it’s been a wonderful ride. So why would anyone buy a Garmin or TomTom GPS anymore? This year, Garmin predicts a sales drop of 20% in its car GPS devices. It’s easy to understand why the personal navigation market for vehicle dashboards is in decline. Jane still comes along for the ride from time to time. What could she possibly offer to warrant this nostalgic gesture? Well, in the car, she’s usually more stable than my iPhone. I’ve just never got around to buying a holder for my iPhone. It’s usually positioned head first in the cup holder or maybe slipping about the passenger seat. Hardly a secure or safe solution. Sure, you can rely on your iPhone’s voice navigation alone, but a properly positioned visual aid is always nice, right? So with the summer driving season upon us, I’ve decided it’s time to fully move my iPhone and its GPS apps into the driver’s seat. As I began my shopping search, I shied away from windshield-suction mounting systems. That’s what Jane has been using. And to be honest, she’s fallen down more times than I’d like to admit. Jane has been bounced around so many times, I don’t really worry about her anymore. But I’m not as willing to expose my precious iPhone to the same dangers. Come to think of it, a suction mounting solution on the dashboard isn’t much better. Sure, it’s a shorter distance to the floor if your smartphone comes loose, but any air time for your phone is a bad idea. A dashboard mounting solution is clearly the way to go, but with something more reliable than suction. How Super is Super Adhesive? So you can buy a glue-mounted holder for your dashboard. But how long will an adhesive last? Even after eliminating the above options, you’re still left with a paralyzing number of offerings. This minimalist solution simply clips to one of your car’s air vents. One concern I have is all that hot air assaulting your device during the winter months. This product is for folks who don’t have a problem doing after-market modifications to their cars. To install one of these holders, you’ve got to do surgery to your dash that’s not unlike rib spreading for open-heart surgery. You slide plastic mounts into existing dash crevices and then create enough of an opening to install the mount’s base. These guys seem really serious about getting the job done right. They handle solutions ranging from kayaks to planes. But you’ve got to have enough patience to figure out their website to build your specific mount. The Bean Bag Makes a Comeback? The more I looked, the more frustrated I became. The solution doesn’t have to be cutting edge. Something like when you rent a portable GPS unit at Hertz, and they hand you a clunky bean-bag base. That monstrosity magically never slides off the dash, no matter how hard you floor it, right? So there are plenty of $20-ish bean-bag mounts on Amazon. Garmin Portable Friction Mount for my old Garmin Nuvi. It showed me an iPhone cradle that attaches easily to the Garmin Portable Friction Mount. Further down the page, I noticed a newer version of Garmin’s Portable Friction Mount. This one wasn’t a bean bag. It was a sleeker unit and had a sticky, rubber pad bottom designed for ongoing reuse. I opened up a new Safari window. As I considered my choices, I mentioned my little research project to my wife. But I’ve got to admit, I’ve grown accustomed to her face. If only I had spent the fifteen minutes I needed to figure out how to keep Jane from popping off her mount a year ago, we might not be in this predicament. Use both GPS Jane and the iPhone!! If your iPhone is strapped in for GPS duty on a long family road trip and you’re in the passenger’s seat, you’re cut off from the world. Sure, you can answer a call in speaker mode, but that’s about it. If GPS Jane is still there to play navigator for those several hours, you’ve got your iPhone back! 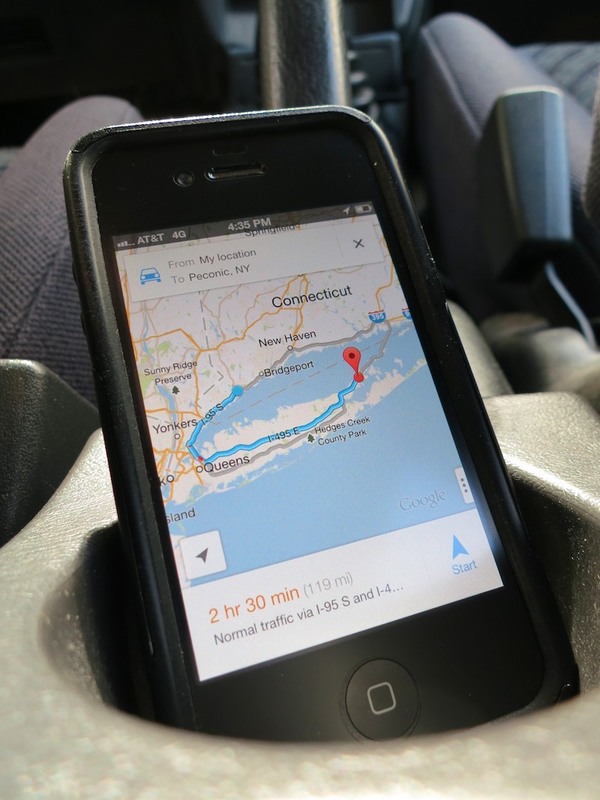 On a quickie trip, your iPhone can do the navigation, and Jane can stay home. Let the summer road trips begin! !